The original title of Jikji is Baegun hwasang chorok buljo jikjisimcheyojeol which means literally that Baegun hwasang copied and recorded meaning of Buddha’s the most important words, Jikji. Jikji’s writer and publisher were different. Baegun hwasang was the writer. Venerable Baegun was born in 1289 and became a Buddhist monk in his early age. He was the Seon* master and passed away in 1374. After his death, his pupils, Seok-chan and Daljam printed this book with movable metal type in 1377. Biguni**, Myodeok sponsored them by offering. Buddha’s the most important words, Jikji is abbreviation of Jikji-insim-gyeonsong-songbul which means you may realize the original nature of mind through meditation, and you can attain Enlightenment. It can be literally translated by several meanings: indicating accurately, honest mind and managing directly. Content of this book is the collection of Buddhist treatises and teachings. Baegun’s pupils printed first and last volume of this book at Heungdeoksa temple of Cheongju city. 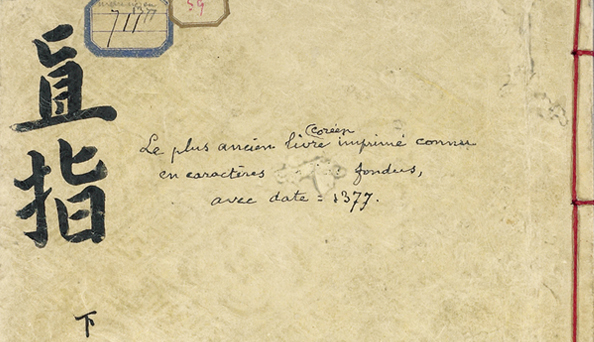 Only last volume of this book was found and this volume has been kept in the National Library of France.